This creamy garlic chicken & broccoli pasta is an easy, affordable and delicious dinner your family will love. 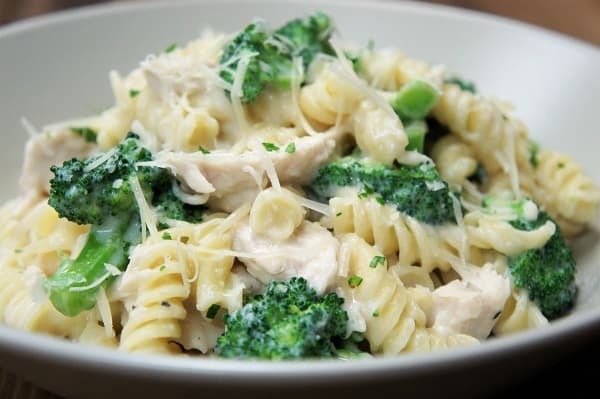 Poached chicken is combined with broccoli and rotini pasta in a creamy garlic and Parmesan sauce that’s not too heavy because it’s made with milk instead of cream. 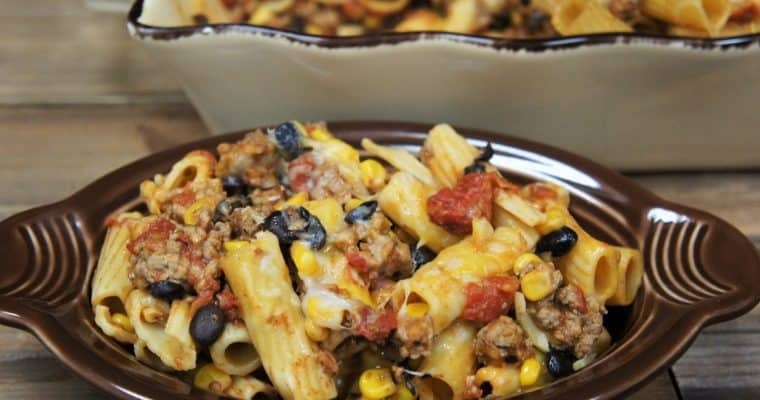 This is a great meal to make on busy weeknights, and since it makes a nice big skillet of creamy goodness, you might even have a little leftover for lunch. Enjoy! Place the chicken in a medium saucepan, large enough so that the chicken breast pieces fit side by side without overlapping. Cover the chicken with the chicken broth. Add the ¼ tsp. salt. Start the chicken on high, as soon as the liquid starts to boil, lower the heat to medium to medium-low and cover. Simmer gently for 20 minutes. Make sure the internal temperature of the thickest part of the chicken breast is at least 165°F, if it’s not, cook another 5 minutes and check again. Remove the chicken breast from poaching liquid and set on a cutting board to cool. When the chicken is cool enough to handle, cut it into strips or bite-sized cubes. Cook the broccoli to package directions, but use only about half the suggested time. If you’re using fresh veggies, you just want to get them going, they will become tender with the heat of the sauce. If you’re using frozen veggies, you basically just want to defrost them. Don’t overcook the broccoli so it holds up nicely in the sauce and doesn’t become mushy. Make sure to drain all of the water from the broccoli before adding it to the sauce. Here we used fresh broccoli that comes in a microwaveable steam bag. You can usually find them in the produce section. We cooked the broccoli for 2 minutes in the microwave and it was perfect. Heat the butter in a large, deep skillet over medium heat. When the butter is melted and foamy, add the garlic. Cook the garlic for 1 minute, stirring frequently. Add the flour to the skillet and mix well. Cook the flour for 2-3 minutes, stirring almost constantly with a whisk or wooden spoon. Add the warm milk, and the Parmesan cheese to the skillet. Stir constantly until the sauce is smooth. 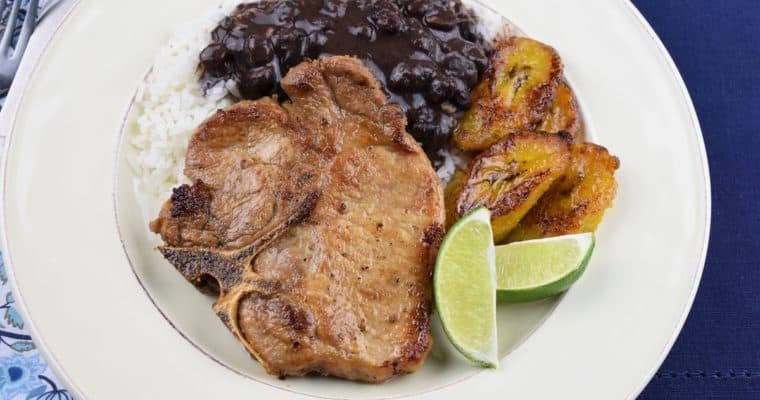 Continue stirring, when the sauce comes to a simmer, lower the heat to low, cover the skillet and cook approximately 10 minutes, stirring occasionally. Keep the sauce at a gentle simmer, raise or lower heat if needed. Taste the sauce, add about ½ tsp. salt and the black pepper, stir well. Taste the sauce again and adjust the seasoning, if necessary. Add the pasta, chicken and broccoli to the sauce, stir well. If the sauce is too thick, add a little bit of the reserved cooking water until the desired consistency is reached, stir well. 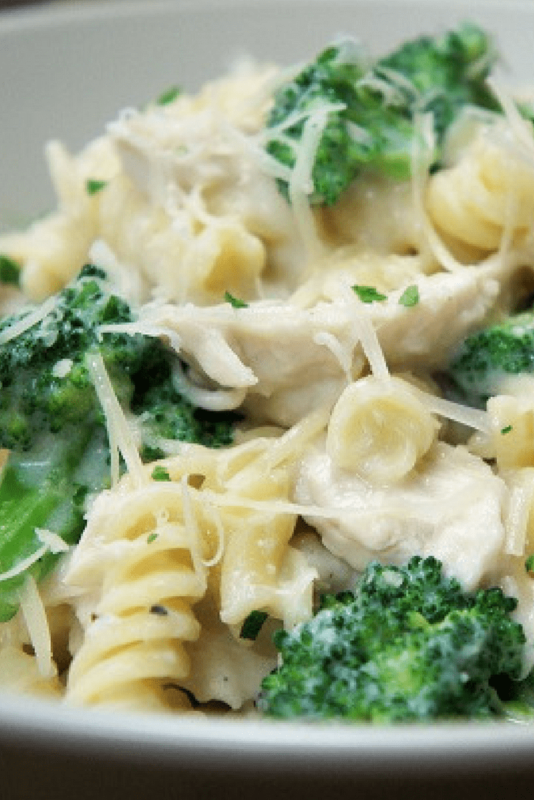 Garnish the creamy garlic chicken & broccoli pasta with chopped parsley, if desired and serve with extra Parmesan cheese. Enjoy!